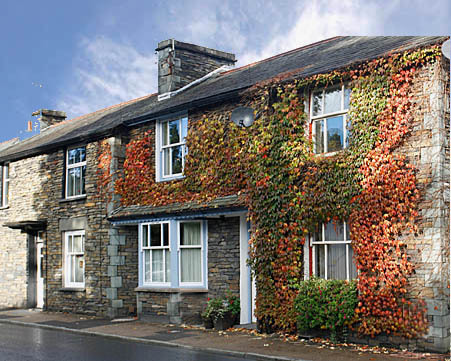 Tweenways is a traditionally built Lakeland stone cottage, located just 5 minutes level walk from all Ambleside’s town centre amenities. The upper rooms have views of the village and surrounding fells. UPPER TWEENWAYS Situated on the first floor, Upper Tweenways comprises a lounge/dining room with compact kitchenette, a bathroom with WC and shower over bath and a double bedroom. The kitchenette has 2-ring electric hob,microwave/oven, sink unit and fridge. The lounge has Freeview and DVD player. On the ground floor are the kitchen/dining room (which gives access to the small furnished patio at the rear of the house) and the lounge. The kitchen is fully equipped with fridge/freezer, fan assisted oven, extractor fan and a sleek induction hob, microwave, slow cooker, toaster, dishwasher and washer/dryer, together with all utensils. The cosy lounge has with multi-channel TV, DVD, board games, etc. The house is open all year, bookings from Saturday to Saturday. Weekly rates for Tweenways Two are £290-492 according to season. For Upper Tweenways they are £222-398. Price includes all bed-linen, towels, heating and lightingThe cottage is totally non smoking and we regret we do not accept dogs and children under 16.